Whether you’re taking part in Fortnite Competitive matches or playing for fun, it’s always a good idea to protect your account. Enabling two-factor authentication on your Epic Games account not only makes it more secure, but you’ll also get the Boogie Down emote to use in-game. If you play Save the World, you’ll also get 50 Armory Slots, 10 Backpack Slots and a Legendary Troll Stash Llama. The Fortnite World Cup begins next week, and all players who compete in the Final Round of the Fortnite World Cup Warmup and other cash prize tournaments will be required to enable two-factor authentication and link their account to an Epic ID. Login into your Epic Account, hover over your username in the top right of the screen and select Account. Once in Account settings, click on the password and security tab to view your security settings. 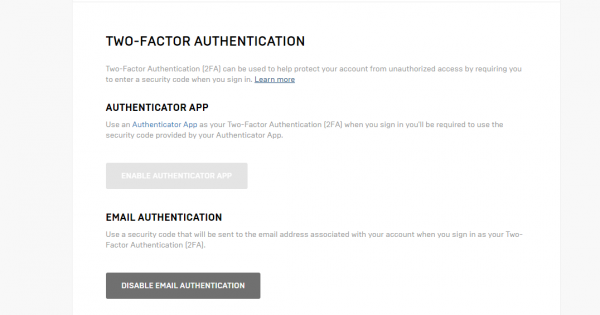 At the bottom of the page, under the two-factor authentication heading, click to enabled authenticator app or enable email authentication as your two-factor method. If you’re going to use an authenticator app, try the likes of Authy or Google Authenticator.